This study aims to set forth a framework for how the design and scenarios should be handled, and how mHealth ecosystem and Universal Design principles should be used in the designing of an “interactive augmented reality 3-D pop-up book” that can be viewed on mobile devices. 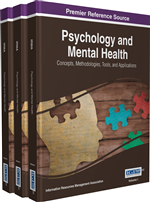 This book, which will pursue the goal of increasing university college professors' awareness about students with bipolar disorder, will be the first mHealth study handled in this scope in the literature. In the background section of the study, the authors first elaborate on the rapid advancement of mobile devices, their proliferation and their reflections on mHealth projects in the healthcare sector. Then the authors include mHealth-related applications that raise awareness, the authors analyze the importance of social awareness about mental health, and finally, the authors get to the core of bipolar disorder and present the current situation. Within the scope of this study, the authors construct a theoretical framework that will assume the guiding role in the completion of an interactive 3-D pop-up book. This study aims to develop a framework for designing an interactive augmented reality 3-D pop-up book and increase the awareness of university teaching staff about learners with bipolar disorder. With the help of this book, it will be possible in the future to act out scenarios that are very hard to actualize in real life. In addition, the spatial adequacy of the college professors who use this book rather than interacting with a 2-dimensional printed book will be positively enhanced. In the book which is to be designed, scenarios will be formed corresponding to the daily problems of people with bipolar disorder and will be acted out in an augmented reality pop-up book which will be presented to university teaching staff through a digital storytelling technique. Individuals with bipolar disorder who spend significant amounts of time at educational institutions tend to have frequent interactions with the professors there. However, due to a lack of empathy on the part of these academicians, the bipolar individuals often become isolated and feel excluded. Mood swings are a large proportion of the lives of persons with bipolar disorder, their quality of life should be enhanced, and they should be provided with equal opportunities. Support for these individuals, which can be quite productive when steered in the right direction, is of utmost importance to reintegrate them into society. A review of the literature shows that although there are many mobile applications for people with bipolar disorder, there is no study involving augmented reality interaction, edutainment, and scenarios enhanced with usability to increase awareness about these individuals. Among the analyzed mHealth projects that target increased social awareness, there is no augmented-reality-supported project that seeks to reintegrate bipolar individuals into society. Despite the development of various mobile applications for people with bipolar disorder and efforts to raise social awareness on special days in recent years, it is apparent that these efforts are inadequate. This study aims to alleviate this deficiency in the literature, and a novel study will be conducted. The seven principles of Universal Design and the “health,” “technology” and “finance” components of the mHealth ecosystem will be combined to construct the theoretical matrix. Scenarios prepared with ZooBurst software will be acted out to create interactive AR 3-D pop-up books; these books will be implemented to academicians at the universities. In the final stage, the efficiency of the study will be evaluated.